Although Rhode Island is only 37 miles wide and 48 miles long, it has 400 miles of coastline. If you like seafood, that is outstanding. Eating local in The Ocean State means eating from the ocean, and that was exactly what we intended to do. 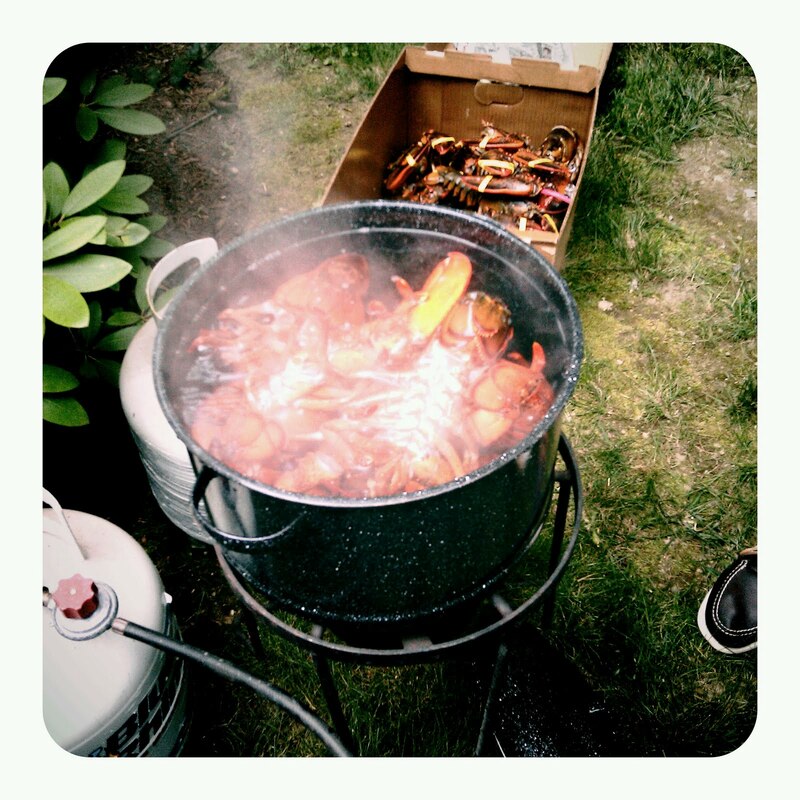 Every summer my wife's family in Rhode Island has Lobsterfest. This is exactly what it sounds like. You eat lobster, and a lot of it. A month in advance her Uncle Nino sent out an email asking for people's orders so he could order the lobsters in advance just to make sure there would be enough. These people are serious about lobster. For those of you that don't know, the lobster has not always been something to celebrate. Lobsters used to to be so abundant in New England, the Native Americans in the area used them for fertilizer. After a big storm, piles of lobsters could be found washed up on the shores around Boston and Cape Cod, sometimes several feet deep. The new European settlers didn't even need traps to get lobster. They just walked out to the tide pools or out the beach after a storm and grabbed lobsters by hand. The lobster industry became strong, but really didn't take off until the mid-19th century when canning made it possible to ship lobster meat greater distances. In the 1880's, the lobster industry was pulling in over 130 million pounds of lobster per year. However, during this time, lobster was always considered a poor-man's food reserved for indentured servants and anyone who could not afford something decent to eat. Kids who brought lobster sandwiches to school got beat up regularly and no one wanted to trade lunches with them. In the jails, the criminals would riot and refuse to eat if they were served lobster for dinner more than twice a week. But all that changed in the mid 20th century as the lobster population got crushed from over-fishing and people discovered how delicious fresh lobster with melted garlic butter and a sprinkling of flat-leaf parsley can be. At my wife's family's house, Lobsterfest is a more reasonable affair and normally doesn't involved monster lobsters. But it does involve t-shirts. Everyone gets lobsterfest t-shirts. Even the babies. 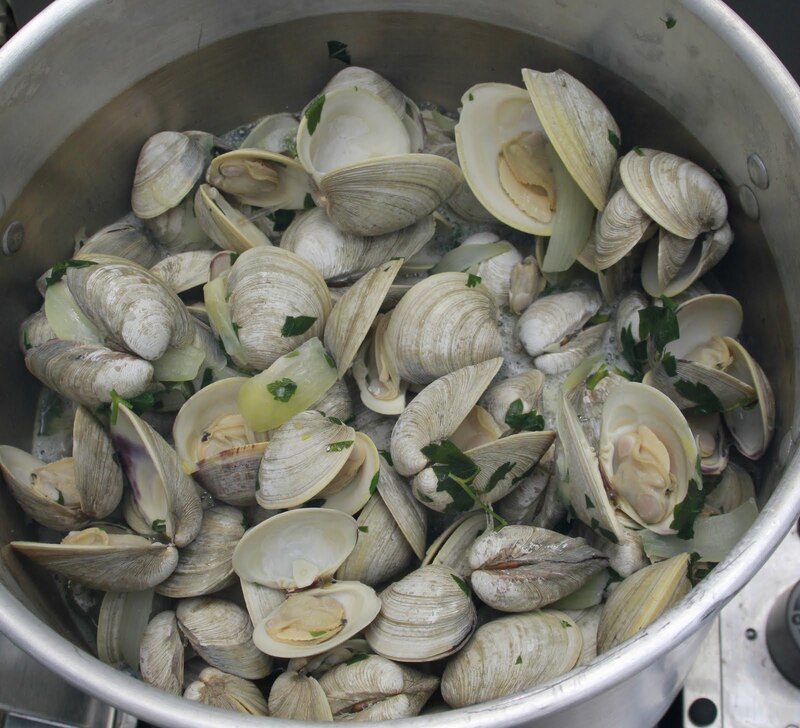 Then there were the clams. Half a bushel (apx. 15 lbs.) of little neck clams steamed in a giant pot of white wine, garlic, onion, parsley and butter. Then there was the steaks. If you are the sort that does not like lobster, you're covered. T-bones and ribeyes were ready. Then there are the sides. Most sides are brought by guests. Pasta with shrimp and artichokes. Chips. Potato salad. The main show is the lobsters themselves. This year Nino got twenty-two 1.5-2 lbs. lobsters. Mike went and picked them up from the dock that morning. Talk about fresh! These would not last long. After all that comes the deserts and hanging out with family and friends. That's how you eat local in Rhode Island. Thanks to all of Kim's family for the great time! going by the $9.50/lb that guy was charging, a 44lbs lobster would have a market value of $418!